Thai SMART Visa - The best visa for digital nomads or almost useless? Posted originally on: January 23, 2018 by	James. Last modified: December 6 2018. There are comments. There has been much talk about a digital nomad visa for Thailand in the last few years, so when the SMART Visa was announced with basic, fairly cryptic, details in 2017, many got excited about what it could mean. No more visa runs?! No more 90 day reporting?! Multi-year visas?! Was Thailand about to acknowledge digital nomads and make them legal? No. They weren’t. In fact, now we’ve got the SMART Visa eligibility details, its actually hard to see who the visa is designed for at all. The new SMART Visa for Thailand lets you stay and work for up to 4 years, with once a year immigration reporting, no re-entry permits required, and even your spouse and children are included. As regular visitors to this blog know, I love to help with thai visa questions, so I couldn’t help giving the run down on this latest visa from Thailand. What is the Thai SMART Visa? Who is the SMART Visa aimed at? What are the eligible targeted industries? Is it a digital nomads visa? Is it relevant to any typical digital nomad industries? Are the new SMART visa benefits any good? When can I apply for a SMART Visa? Where do I apply for a SMART Visa? 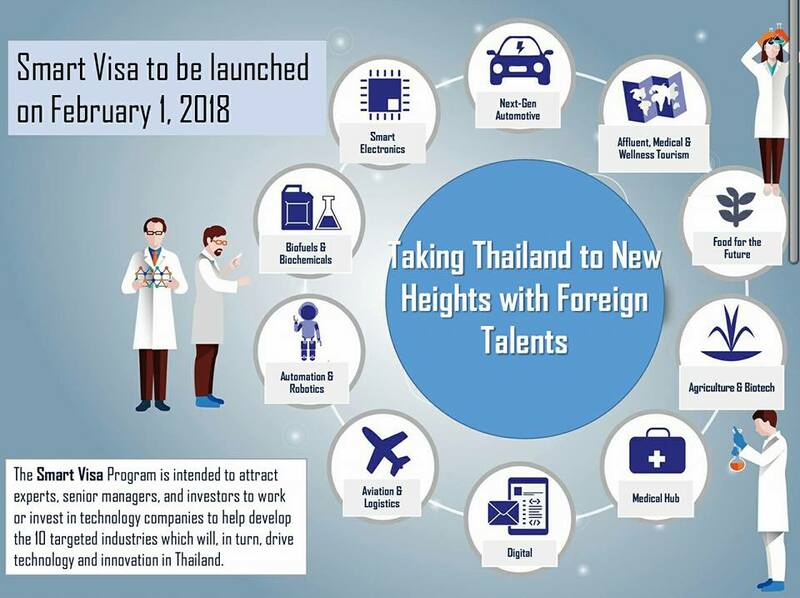 The SMART Visa is Thailands attempt to try and attract foreign skills and money in to Thailands business and technology ecosystem. It’s been introduced by the PMDU (Prime Ministers Delivery Unit) to help build Thailand 4.0. “SMART Visas will be an important factor in pushing the country toward Thailand 4.0” said Duangjai Asawachintachit, secretary-general of the Board of Investment. The SMART Visa is designed for companies (in one of 10 targeted sectors) to bring in expensive foreign talent to work for them easily (T and E visa). It is designed to attract investors who also want to live in Thailand (I visa). And its designed for founders of startups who want to bootstrap, develop and grow their business in Thailand (S visa). The new SMART Visa isn’t a digital nomad visa. Its almost completely useless for digital nomads. It is a visa focused around technology, and it is designed for people who want to be mainly based in Thailand. Not very nomadic. So if you want to go and live in Thailand for 4 years, it could be for you. But that means you aren’t much of a digital nomad. A few industries jump out of the list – I know a few people in high end luxury and health tourism. The digital category includes ecommerce, enterprise software and content, creative media and cloud computing – I know a few people working in each of those industries, so maybe the project you are working on falls in to one of those too. The “digital” category may need updating by the BOI in future, it seems too vague right now. The privileges the SMART visa gives are good compared with most other visas from Thailand. Up to 4 years validity, once a year reporting to immigration (normally 90 days), no re-entry permits required (means you can come and go without worrying your visa will be messed up), spouses and children included (great if you have a family), spouses given permission to work anywhere (never heard of anything like this before). The visa became available on 1st February 2018, so you can apply for it, if you are eligible, right now. If you are a skilled science/technology worker, maybe like an app developer or hardware engineer, this visa allows you to come and work in Thailand easily, and bring your family. If you’re getting San Francisco-style wages from a company, Thailand is a truly amazing place to spend that money. 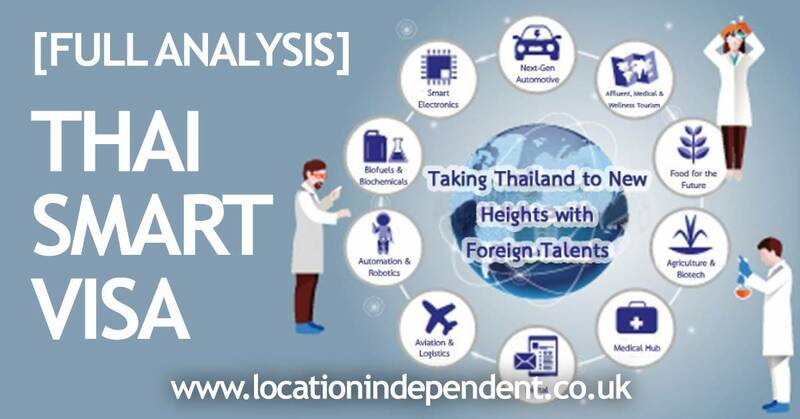 If you have your own Thai company in one of the required industry sectors, and you’re the expert, then you could transfer your existing Non-Immigrant Visa “B” to this SMART visa and enjoy the benefits. If you are an investor, this visa is for you. It’s a nice bonus for any high net worth who wants to fund a startup, that they get to live in Thailand trouble-free. Work permit is for the mentioned company only, so perhaps suitable for a Chairman or Board member role. With a work permit and tax residency, it could also be a nice way to minimise tax payments. Almost the same as the T Visa, but this visa is for non-scientific non-technical people, designed for CEOs, MDs, and high ranking executives. Requires 10 years of work experience, and a degree, so no-one under 30 years old is going to be eligible. 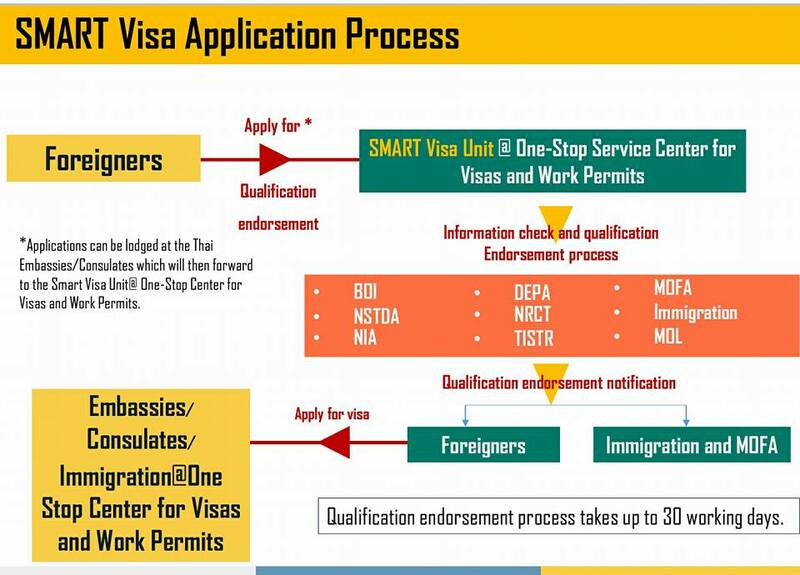 For entrepreneurs in the targeted industries with their own Thai businesses, this visa could be interesting as meeting the requirements could be easy, so switching from Non-Immigrant Visa “B” to this SMART visa is well worth it. For entrepreneurs in the targeted industries with a business based elsewhere and wanting to stay in Thailand, it could be worth setting up a subsidiary business in Thailand to employ yourself and then qualify for the visa. Designed for early-stage startups or projects that will turn in to businesses. With the banking deposit, perhaps a founder with some Angel investment who wants to bootstrap the business for a year. The rules for this visa seem overzealous, like they are only doing this so approved accelerators and incubators in Thailand have a way of attracting foreign entrants to their programs. That makes sense, but not much use to anyone else. 3 = “Joint venture” could mean a few things, but we’ll assume its entering in to a partnership agreement with a Thai person or company. Being eligible is just the first step in getting this visa. Getting approval is the next thing and this has to be done before requesting the visa. Every application has to go through several department approvals. Your application must be approved by the BOI, the National Innovation Agency, the Digital Economy Promotion Agency, the Ministry of Foreign Affairs and other agencies. This process is expected to take “around 30 days” but it will probably take much longer. Once you’ve been approved, foreigners who meet the new visa’s requirements can apply for it like any other visa – from Thai Embassies and Consulates around the world. If you are in Thailand, you can go to the One Stop Service Center for Visa and Work Permit, located at 18th Floor, Chamchuri Square Building, Phayathai Road, Pathumwan, Bangkok 10330. 1) Is your business, project or investment in one of the 10 required industries? 2) Do you have a business where you do or could pay yourself a 200,000 baht (£4,500/$6,250) wage per month? If you aren’t, this visa isn’t for you. If you are, you could qualify for the T or E visa. Otherwise, carry on…. 3) Do you have 20 million baht (£450K/$625K) available to invest and not touch for 4+ years? If you don’t, this visa isn’t for you. If you do, you could qualify for the I visa. Otherwise, carry on…. 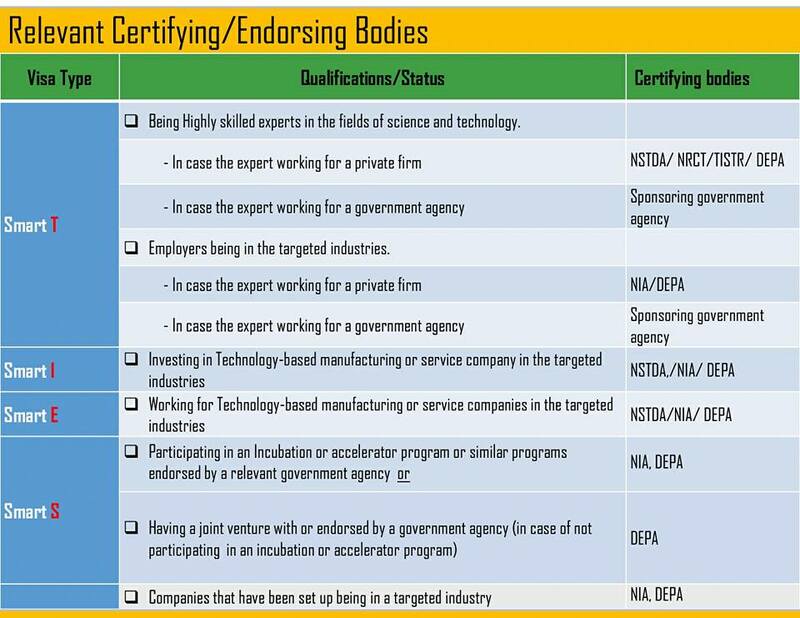 4) Has your project/startup been accepted on a Thailand-approved accelerator or incubator program? 5) As a project/startup founder, do you have 600,000 baht (£14K/$19K) in a bank account somewhere. If you haven’t, this visa isn’t for you. If you have, you could qualify for the S visa. Who is eligible for SMART Visa? All nationalities are eligible to apply for the visa if the other business and personal requirements are met. Can I switch a Non-Immigrant Visa “B” to a SMART visa? Anyone who already has a business visa may change to SMART Visa to enjoy better rights and benefits as long as they meet the requirements. Does the incubator / accelerator have to be based in Thailand? 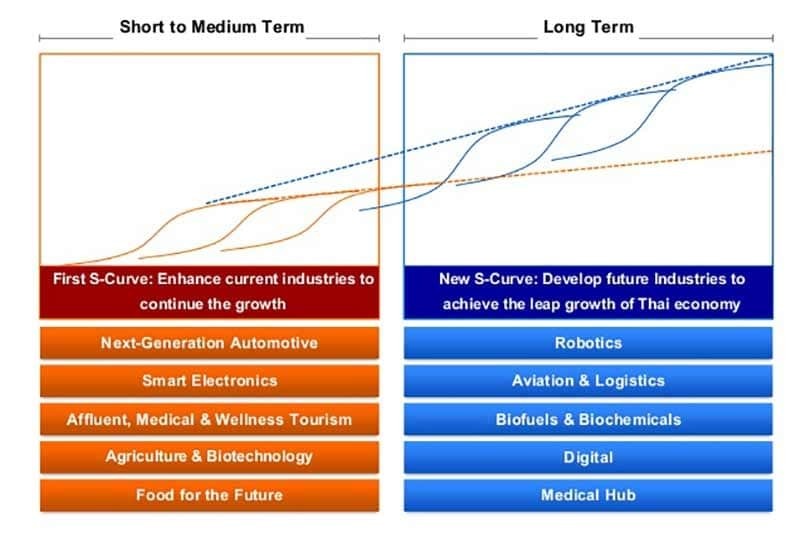 What accelerator or incubators are running in Thailand? F6S, which is the industry standard for finding accelerators and incubators currently has ZERO listed running in Thailand. So getting on to an approved accelerator might be tricky! Luckily we know of a few others – check out 500 Tuk Tuks, True, DTAC, Spark, or more are listed here. Expected as a digital nomad visa, the reality is that you must be an expert, top level exec, serious investor or a startup that happens to tick the right boxes. I can see why the government have done this. But as usual, the Thai departments behind the visa have over-thought it, designed it by committee, and its turned out not really serving anyone that well. Existing business who want to hire from abroad need to be approved and then pay highly competitive wages (within Thailand). Investors need to have a serious high net worth to put in over half million dollars, and with crypto markets so bullish, and the Thai startup ecosystem so infant, who would invest that amount just for a visa? For startups, it might be attractive, but the requirement to be involved with an accelerator or incubator really reduces the amount of founders this will apply too. The only people I can see benefitting are those with Thai businesses, or non-Thai businesses that can switch their current structures to a Thai one. So not really attracting any new talent, but legalising/restructuring existing businesses and visa setups. Smart? Nope! This could have been a brilliant move by Thailand to embrace the digital worker industry, but they’ve failed to do so. What do you think about the SMART Visa? Is it for you? Are you going to apply? Have you applied? Let me know and leave a message in the comments below. Previous Post: Kuching Digital Nomad Guide: A New Southeast Asia Hot Spot for Nomads?